Dave did a fantastic job on our pool. We had some damage over the winter, and Dave repaired the damage and installed a new liner in our pool. His communication is excellent, always responding to any of my phone calls. He scheduled a time to repair and he was very prompt. We had a great summer in our pool this year thanks to Dave. I would highly recommend him – A++++++. From references and reviews, I knew Dave was the man I wanted to install my pool. Pools are all he does, not just a landscaper with a side job. He works 7 days a week and is very busy, but there is a reason he is busy -- he has many loyal clients who will only use him. If you can find a pool guy that is NOT busy in June, there is a very good reason he's not busy, and you should ask yourself why! He handled my difficult yard installation, and we are very happy. Dave installed an 18" round pool for my house in Revere. He arrived on time, the job was completed properly and as his motto goes -- "no wrinkles". The man does work 24/7, and does return his phone calls at night. I can't recommend Dave's Above Ground Pools enough. My family is enjoying our summer thanks to Dave! Thanks a lot. A special thanks to Dave for doing an amazing job last fall on our huge 18 x 40 pool. We had our annual block party this past weaken, and the pool was by far the biggest attraction. I just want to say thanks to Dave for making all of our summers cooler-for working everyday especially in this extreme heat. You guys rock!! Enjoying my pool because of you! We've had Dave come two years in a row to service our pool - once to install it and the next summer to put in a new liner. The pool company had sent us the wrong pieces and he guided us on how to handle the incorrect order and get what we needed. We had him back again this year to put a new liner in after a rough winter tore through it. We are impressed by his communication when setting up appointments, efficiency when on-site, and the quality of his work. He is reasonably priced (we called around) and he stands by his work. The pool will provide years of enjoyment for our kids thanks to Dave and his team! Dave installed an above-ground pool for us. He did a FANTASTIC JOB!! I would highly recommend. He was punctual, knowledgeable, energetic. A+++++ Service!!! Want to thank Dave & his crew for a beautiful job well done! Pool looks great, and we're ready for the heat! Dave, you did an awesome job on our 18 x 40 super oval install last August. And we opened it without a single problem this Spring. Thanks again for an excellent job! Fabulous! Dave managed to fit us in over a holiday weekend to get us up and running, We were first time customers and will definitely use him again as well as recommend him. He kept us updated as to his arrival time and was very knowledgable! Thanks Dave! I couldn’t be more pleased with Dave and his crew! Right from the early conversations with Dave on the matter of removing my old above ground pool and replacing it with a new was a pleasurable, organized experience! Dave’s professionalism and attention to detail is extraordinary ~ plus a fantastic personality to boot! Dave was great, he showed up when he said he was going to both times to review the site and install the pool. His crew was very nice and overall did a nice job. Dave is prompt in returning calls and very punctual. He is extremely knowledgable as he was able to handle complications with the deck surrounding the pool, with expertise. Although I hope to never need his services again - I would not even consider calling anyone but Dave! Dave installed a new above ground pool that replaced one we took down. Dave was GREAT! He showed up when he said he was going to both times to review the site and install the pool. He was very nice and overall did a nice job. "Dave works 7 days a week and is available to take calls any time (but returns messages only after the workday is done). In talking with him during the install, I learned that he is always up for a challenge. He is the guy that is not afraid of the pool install that is tough or out of the ordinary. 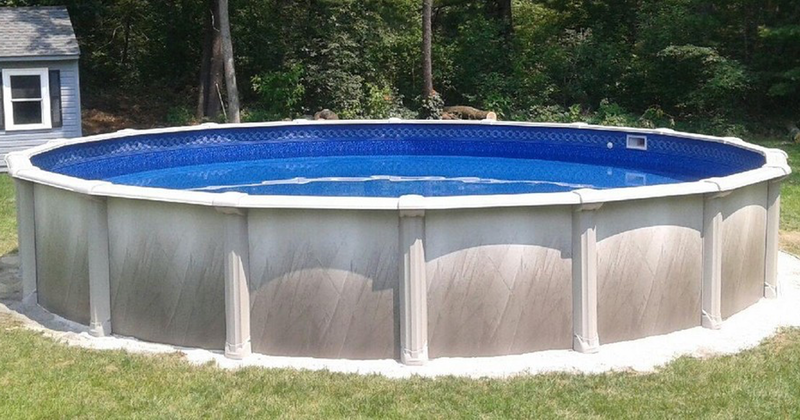 My site was not particularly difficult, but he told me that the oval shaped pools are a little harder to install and a lot of companies really just want to do round ones, because they are the easy installs. Perhaps that is why nobody else returned my calls . . . but Dave did! His workmanship is nothing less than stellar. He showed up on time, and he took a lot of time to make sure the site was prepared extremely well. He leveled, sanded, flattened and tamped, and THEN he took over an hour with a real surveyor's transit to make sure every single post was perfectly at the same level within 1/8 of an inch. This is incredible workmanship, and I was really impressed. Once the site work was done, he had me approve the exact location of the pool to be 100% sure I was installing it where I wanted. Once again, very impressive, CARING work done by a guy that really loves what he does. He is a real asset to have as a professional consult for any pool problem you have. Dave was in and out in one day and was very thorough to educate me on how to take care of my new pool for long-term enjoyment." "Awesome job by Dave's Above Ground Pools in Peabody, MA. I own my own business in the Boston area, and I had never met Dave before this experience. I wish all contractors were as good as this company!" "I found Dave's on Facebook originally! Dave, the owner, is very responsive on the telephone – you leave a message, and he calls back after his workday is completed. I purchased a pool from Namco. After contacting every single name on their “authorized installer list” who did not call me back or had a 30-day or more wait list, I contacted Dave. He gave me a price over the phone, was extremely thorough with his explanation, and was exactly on time for his scheduled date for the install. Dave’s pricing was competitive, and he added so much more in service that would surely have cost more with the bargain basement installers. Dave was very hard working and polite."